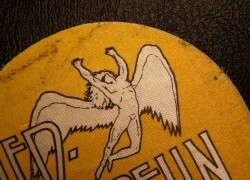 Item description: Led Zeppelin circular backstage Pass in yellow from the 1977 North American Tour. Screen printed yellow and black on white silk. Reverse would have peel off backing. Condition report: Used pass. 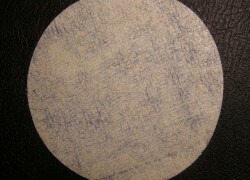 Peel off backing now missing. Some light use. 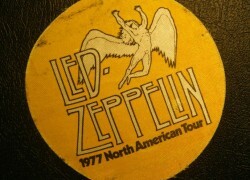 Background to Led Zeppelin’s 1977 North AmericanTour: This was the first tour embarked on by the band following their enforced layoff caused by Plant’s car accident in Greece in 1975. During this sabbatical, the band had recorded their seventh studio album, Presence. Rehearsals for the tour eventually took place at Manticore Studios, Fulham in early 1977, where the band worked for two months on a new set list. Led Zeppelin’s manager Peter Grant conceived this series of concerts as an effort that would reassert Led Zeppelin as the dominant band of the decade. Fifty one concerts were scheduled over a three-leg period, for 1.3 million ticket holders. It was Led Zeppelin’s biggest ever tour, and tickets sold at a rate of 72,000 a day. The tour was scheduled to commence on 27 February at Fort Worth, Texas, but Plant contracted laryngitis and the schedule was postponed for a month. It eventually kicked off on 1 April, at the Dallas Memorial Auditorium in Dallas. The delay reduced the amount of time the band had available to rehearse, since all their equipment had already been airlifted to America. 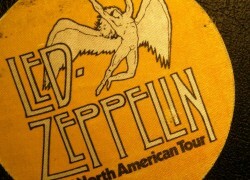 Led Zeppelin’s 1977 North American Tour was a massive financial success, as the band sold out large arenas and stadiums. On 30 April they performed to 76,229 people at the Pontiac Silverdome (the Detroit venue), a new world record attendance for a solo indoor attraction, beating the 75,962 that The Who attracted there on 6 December 1975 for Opening Night, and grossed $792,361.50 (also a record breaker). Lengthy stints were spent in New York City and Los Angeles, where the band performed six sold-out shows each at Madison Square Garden and the Los Angeles Forum. In New York alone, the band spent no money on advertising for the gigs, relying solely on street demand to sell out the shows, and enough ticket applications were received to sell out a further two nights had time permitted. For the tour, the band chartered Caesar’s Chariot, a 45-seat Boeing 707 owned by the Caesars Palace Hotel in Las Vegas, to shuttle them between cities. This plane should not be confused with the more famous Starship, which had been used by the band on its previous two concert stints in North America, but which was permanently grounded in 1977 due to engine problems. For many of the concerts on this tour, Jimmy Page chose to wear a striking custom-made white silk dragon suit or as it was known as the “Poppy White Dragon Suit”, as is captured in several famous photographs of the band. It was also on this tour that John Paul Jones introduced a triple necked acoustic instrument which contained a mandolin, twelve string guitar and six string guitar. He used this instrument on “Ten Years Gone” and the acoustic portion of the setlist. 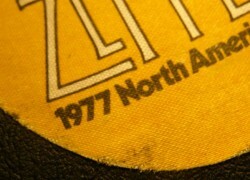 Special notes: The 1977 North American Backstage Pass came in four colourways, yellow, red, blue, green. Each colour allowing access to specific areas.